It sure is fascinating to watch Assassin’s Creed reinvent itself. A series that was by and large stagnant for years—even going so far as to return to older design tropes with Unity—it now seems determined to evolve into something entirely new. Something that, if we’re being honest, quite resembles (at least on the surface) The Witcher 3. Last year’s Assassin’s Creed: Origins was the first step in this process, removing the series from the cities it had outgrown and putting it in a vast, detailed recreation of Ptolemaic Egypt, and then filling Egypt with mysteries big and small. It continues in 2018’s Assassin’s Creed: Odyssey ($60 preorder on Amazon), as for the first time ever the series adds dialogue trees. 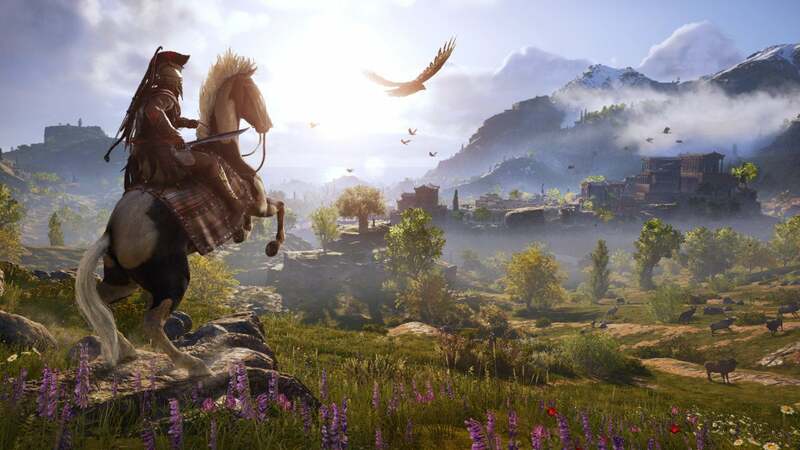 Ubisoft is determined to turn Assassin’s Creed into a full-fledged RPG, and damn it’s exciting. For 2018, Assassin’s Creed goes even further back in time. Not quite as far back as I expected—the “Odyssey” of Assassin’s Creed: Odyssey is not actually Homer’s per se, which would’ve taken place almost a millennium prior to Origins. It is a prequel though, taking place towards the end of the “Classical Greece” period, around 400 years earlier (or around 450 BCE). That puts it right around the legendary Battle of Thermopylae, the famed 300 Spartans versus the entire Persian army. It’s also a period where Athens went from one-among-many states to one of the dominant forces in Greece. And it’s right around the time of the Peloponnesian War, which saw Athens fighting against rival Sparta. Whether any of that will play into the story of Odyssey? I honestly couldn’t say, but it seems likely. In any case, you play as either Kassandra or Alexios, both of whom come from Athens and are thus mistrusted by many in the loose coalition of Greek city-states. This is pre-Assassins, which makes sense given Origins told the story of that order’s beginning. I was told by Ubisoft that the story does tie into the overarching meta-narrative though, even if none of that was apparent during my demo. I chose to play as Kassandra for most of my demo, which took up about an hour on Monday night. 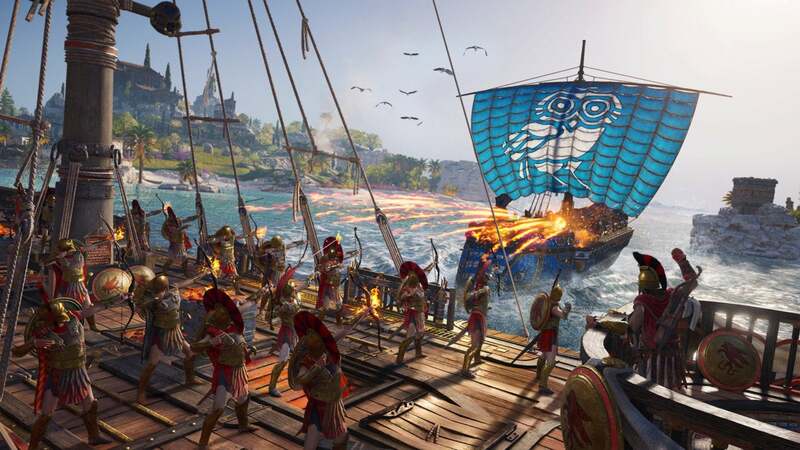 There were a bunch of options for me to choose from—a naval combat section, some loose exploration, an enormous (by Assassin’s Creed standards at least) battle sequence, and the Socrates quest Ubisoft showed during its press conference. And I chose to play the Socrates quest twice. It’s a bit hackneyed, Kassandra just randomly chatting up this famed philosopher. The two already had a preexisting relationship when I took on this quest, and I’m curious what the circumstances behind that are. 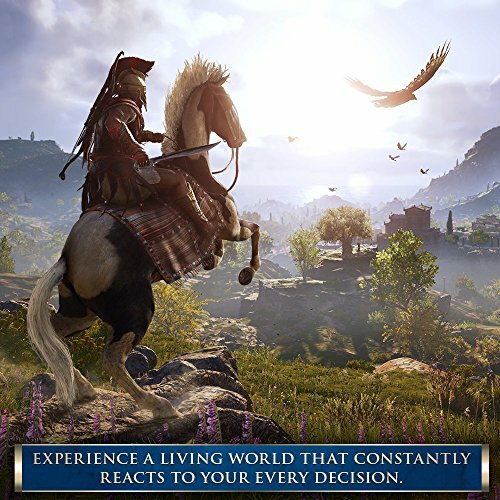 I chose to play it twice though because Assassin’s Creed: Odyssey is all about choices. For the first time ever, your actions in the world have real and meaningful consequences. You’ll even choose between dialogue options which can effect characterization in ways big and small—by, for instance, making Kassandra a bloodthirsty monster or a champion of freedom. The quest Socrates gave me concerned a local rebel, a man who had been captured by the guards and sentenced to death for his actions on the island of Delos. Being sacred ground, he obviously couldn’t be killed on Delos, so Socrates told me his location and left it to me whether I’d rescue the poor chap. But upon returning to Socrates, he interrogated me. He asked why I killed the guards, asked whether the guards’ lives were worth less than the rebel I aided. And I felt like Kassandra’s response was appropriate, as she said something along the lines of “I honestly didn’t even think of them.” Because I didn’t. Never before has Assassin’s Creed asked me to care about whether guards lived or died. So I replayed the mission. I chose new dialogue options with Socrates this time, just to see what he’d say. But I mainly wanted to rerun the mission in true stealth mode, a ghost who slipped in and freed the rebel, then escaped without bloodshed. It doesn’t make a huge difference at the start—there’s a single new line of dialogue from Socrates when you decide to spare the guards. But Socrates has a very appropriate bit of dialogue afterward: He says “Our choices are like ripples on water. 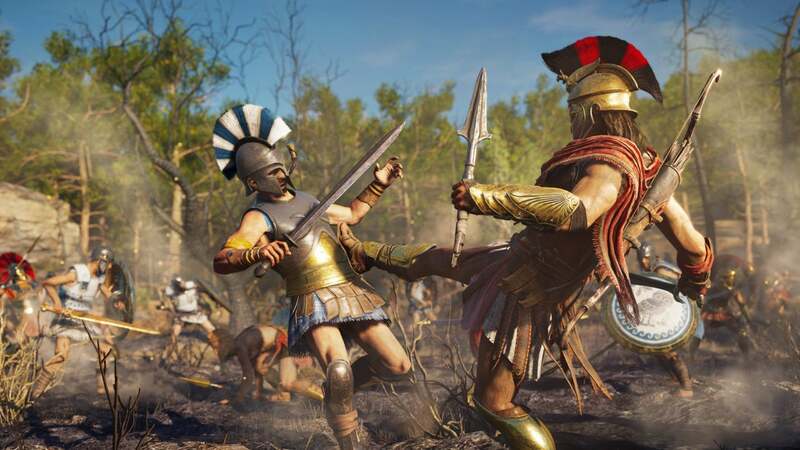 They seem tiny and insignificant at the beginning, but they can become devastating tidal waves by the time they run their course.” It’s an appropriate metaphor for Assassin’s Creed: Odyssey, which seems determined to force players into tricky situations. No other Assassin’s Creed has even attempted this sort of branching narrative structure, and I’m not sure how successful it’ll be. It’s ambitious as hell though, transforming the series into a proper RPG of sorts. Given how much Origins felt like a departure from the formula, I’m surprised that Odyssey is doing the same just a year later. I also played through the battle sequence shown in the press conference trailer. This part I’m a bit less enamored with—Assassin’s Creed’s combat isn’t my favorite, even in its reworked Origins form, and with about a hundred people on screen I felt like the controls were a bit sloppy. Still, I learned a lot about Odyssey’s combat from that brief section. There are no shields in Odyssey, which is a marked change from Origins. Ubisoft’s also replaced the weapon-specific super moves from Origins with a set of skills I assume you unlock over time. My favorite? That “This is Sparta” kick from the trailer is actually a move you can unleash on enemies, kicking them in the chest and sending them flying across the battlefield. It’s ludicrous to watch, and I giggled every time it happened. You can also heal yourself, steal and enemy’s shield and hit them with it, and more. I assume these skills are remappable depending on what you’ve unlocked, though I didn’t delve into the skill tree to find out. Check out my footage of the battle below. You’ll notice I kick guys in the chest a lot. Aside from that? It’s basically Assassin’s Creed: Origins in Greece. Delos looked beautiful, with a temple set on top of a hill, plus multiple larger-than-life statues of the gods, of Greek soldiers, and so on. It’s an evocative setting, and taking a look at the map it seems to encompass a sizable section of the Greek peninsula and island chain, from Lesbos to Mykonos to Athens and more. It’s enormous. Gear seems about the same as the previous game, with a Destiny-style loot system. Leveling also seems similar, and taking out enemy outposts certainly felt familiar, with the usual list of high-value targets to take out and loot to grab. But I had a great time, or at least I feel better now about Odyssey’s prospects than I did when it was first announced. There are some issues, especially with lip-sync at the moment. Origins grew on me though, especially with the fantastic Curse of the Pharaohs expansion this spring, and Odyssey seems like it’s set on creating the same mix of history and mythology. It’s a direction I’m really enjoying, and I hope the series continues down this path for a while. Add in a more fleshed out dialogue system and Witcher-style quests? 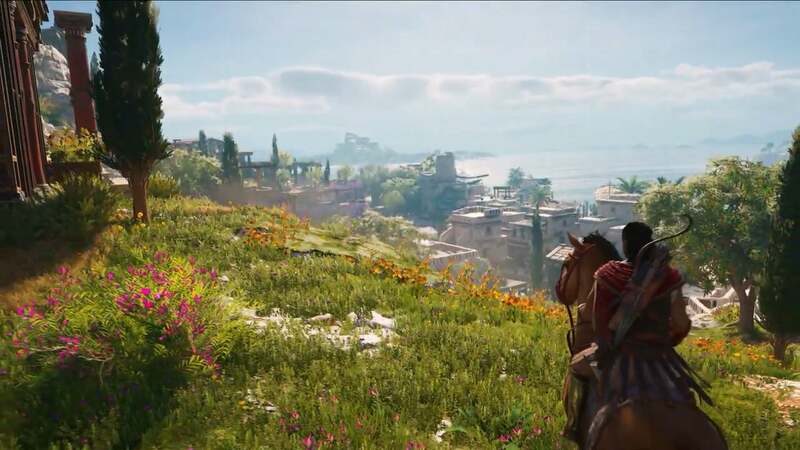 Suddenly Assassin’s Creed is an exciting and fresh-feeling series again. I never would’ve predicted that twist. Look for the game to launch on October 5, and stay tuned to PCWorld as we bring you more hands-on coverage and videos from E3 2018 all week long.